Sclerotherapy uses injections of chemical irritants or detergents into the smaller veins to cause inflammation and scarring which shuts off blood flow through the vessel. 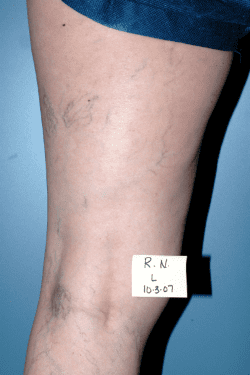 Once blood ceases to flow into the treated vein, the lack of color from the blood makes the vein “disappear”. Dr. McMullen only uses Polidocanol and Sotradecol for sclerotherapy (we do not use saline, which can burn and sting on injection, and its effects are typically not permanent). 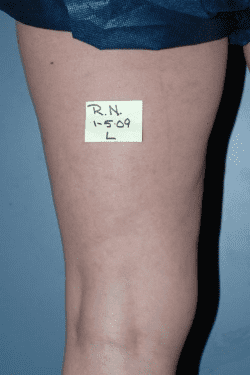 Treatment of the subcutaneous, greenish-bluish reticular veins usually requires one session of foam sclerotherapy, but compression stockings must be worn continuously for 5 days to achieve the best results. Spider veins and telangiectasias require multiple sessions, usually 2 weeks apart, to achieve maximal clearance. We also treat these smaller veins with a combination of sclerotherapy injections and laser if needed, to achieve faster, more complete clearance.